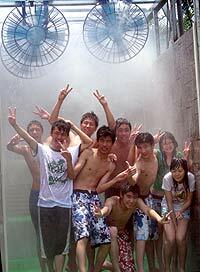 Summer is the queen of seasons in Taiwan, with a reign that stretches through most months of the year. 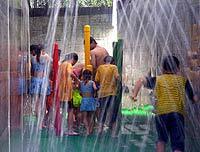 The lifesaving antidote to the stifling, relentless heat is water and Taiwan, being an island, has no shortage of water-related activities. Here are a few priceless gems sure to make your summer sparkle. 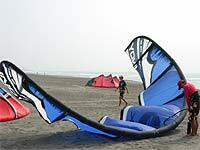 Taipei County's Formosa Fun Coast is perfect for a wet, fun-filled day out. 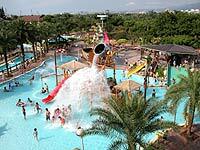 Roller coasters and rides are replaced by water slides of different heights, lengths and speeds. 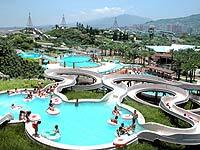 The water park provides plenty of thrills for everyone, ranging from zippy free falls and winding slides, to a relaxing float down a lazy river that travels through the watery kingdom. Another option is to pepper the stagnant summer with a pinch of adventure along the northeast coast. The golden-sand beach of Yanliao Seaside Park in Taipei County is the longest in Taiwan, extending three kilometers to Fulong Beach. Fulong is a popular location for non-motorized water activities, such as swimming and canoeing. 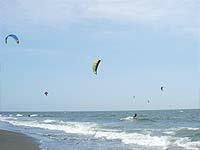 Other all-time favorite beach options are Green Bay for paragliding, surfing and other water sports, and White Sand Beach for swimming. Longdong Bay, the largest bay on the northeast coast, is among Taiwan's top diving and snorkeling sites. Its clear aquamarine waters provide an intimate rendezvous with kaleidoscopic marine life. For urban refreshment during the summer, consider taking a leisurely cruise along the Danshui and Keelung rivers of Taipei's "Blue Highway". There are many types of boats to choose from, including ferries that stop at some of the capital's major tourist spots. *Until Sept. 16, the 2007 Taiwan Northeast "Water World Festival" will take place for the first time ever in Yanliao Seaside Park, which is located in Fulong district of Gongliao township in Taipei County. The theme of this festival will be an imitation of natural elements, such as wind, rain, water and fire, merged with sound/light technology and special effects to "wow" the audience with an amazing, stimulating, and virgorous "water world". How to get to the beaches: Keelung Bus Co. provides transportation from Keelung to Fulong on the northeast coast. You can also take a Da-you bus from in front of the Taipei Railway Station. Take the Hualien line to any one of the numerous stops on the northeast coast.